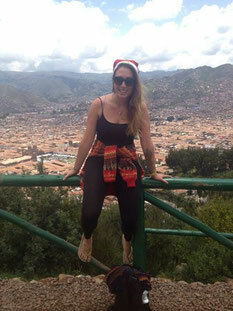 My first week working in Kokopelli hostel Cusco goes by with little to report back on. I work behind the bar, which is the same as any other bar ive worked behind, and we did what bar workers do. Get drunk on free alcohol. Then wake up about 2pm and do it all over again. It was a pretty unfifillimg lifestyle, so I guess what was to come was to encourage us to move on. Just a harsh way of showing us. On Christmas eve my boyfriend and I decided to break our usual sleeping pattern and wake up before 12am managing to catch the free breakfast of scrambled eggs for the first time since we arrived. We then hit the annual Christmas eve market in the main square Plaza de Allmas. A few days before on one of our 4am walks home we had spotted a glowing Jesus Christ statue set up on one of the hills, and committed to walking to see in one day. And what better day than Christmas eve. So with religious influence upon us we set upon what we thought would be the short walk to see San Cristobal blanco. Equipped with Christmas jumpers and hats, the first few steps greeted us with the unusual sight of the Sun on Christmas eve and reminded us we were no longer in England, and jumpers weren’t needed. Sun cream on we continued the uphill struggle which was already proving that the distance from where we started was definitely an illusion, and we still had far to climb. Having committed now we couldn’t bail out, so we were happy to have reached an entrance claiming it was not too far away. Well that’s if you paid 70 soles. Or you could continue travelling an hour ‘that way’ (the opposite direction) up a few thousand stairs and get there for free. Unfortunately the saying of the trip so far came into play; ‘We have more time than money’ So I found myself on YET ANOTHER trek with flip flops on. Within the first 10 minutes we had been chased by llamas and dogs, nearly had a heart attack, and broken a flip flop. All this 4k above sea level. About 3 hours after we set off we finally reached the top of the mountain and to the statue of San Cristobal blanco. The view down over cusco was nothing but incredible. 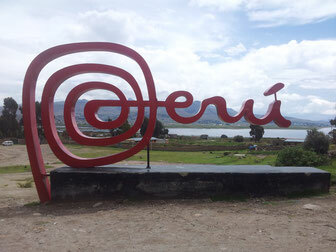 The sun evaporated the memory of the unwanted trek, and we basked in the Christmas eve sunshine and fresh Peruvian air. And if Jesus had granted us a Christmas miracle, a set of stairs appeared that lead straight back down to the centre in a matter of minutes. Exhausted after the trek we indulged in another Christmas present of an hour long massage each, and melted into the massage bed in absolute bliss (the £5 price tag helped) After an awesome alternative Christmas eve, we fell back into the old English tradition of drinking yourself into a haze. However the sound of fireworks drew us to the outside world just before 12am and the sight we saw sobered us straight up. Walking towards the crackles and sparkles we couldn’t help but ignore the hundreds of family’s wrapped up in blankets sleeping on the streets. The sight was really heart wrenching and immediately made us feel guilty for being so unaware and also incredibly privileged for being in our current situation. We noticed a man holding out his hat begging for coins. It was the picture of ultimate sadness. A man begging on Christmas day while people walked past laughing,smiling and setting of fireworks. Ryan bent down to give him the last of his change he had in his pocket and the man reacted with the most sincerest of gratefullness. While it made us feel good to help, we only felt more aware of the rest of the homeless begging for money and we became overwhelmed by sadness for everyone less fortunate than us. It was a massive eye opener, and we decided to stop drinking and not go to the club that night, and stay and enjoy each others company while watching the fireworks instead. Just as well we didn’t really, as the following night I ended up in hospital. 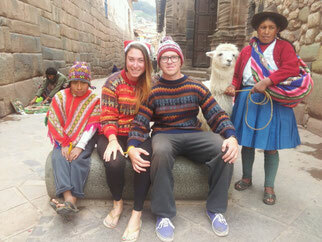 Waking up early, without a hangover we hit the streets of cusco to see what was occurring. You wouldn’t be mistaken for thinking it was any other Wednesday as transport was running as normal, all shops were opening and the streets were buzzing, even the local walking tour had started. We treated our selfs to a shameful Starbucks and sat watching out over the city. And then it all started. I will save the details but I suddenly become quite ill. We went back to the hostel and I spent the next 10 hours running between the toilet and the bed. Friends would offer medicines, but nothing made even a slight difference. Things got progressively worse as I passed out and was rescued by another voulenteer. From then on Ryan didn’t leave my side, and as we agreed it was time to get a doctor I had fainted one to many times. The doctor came within 10 minutes and was straight at my side and transporting me to nearest hospital before I could realise what was happening. The service I received was incredibly and nothing like you would expect a South America hospital to be. We got a private room with two beds and I was immediately put on a drip replacing the fluids I had lost. They took some tests and I was left to rest, unaware of my condition, but feeling a million times better under their care. 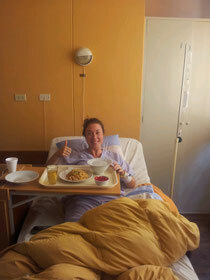 They gave me chicken soup and chicken noodles, that neither did I want too or could I (I’m a vegetarian) eat. However it was a good photo opportunity. So guys, if you ever need to go to Hospital on Christmas day, make sure its the Cusco One!